There’s a new world record for beating Super Mario Bros. quickly—and it may be the fastest possible time that a human can achieve. That’s why Darbian, the man behind the new record, is now hanging up his hat. 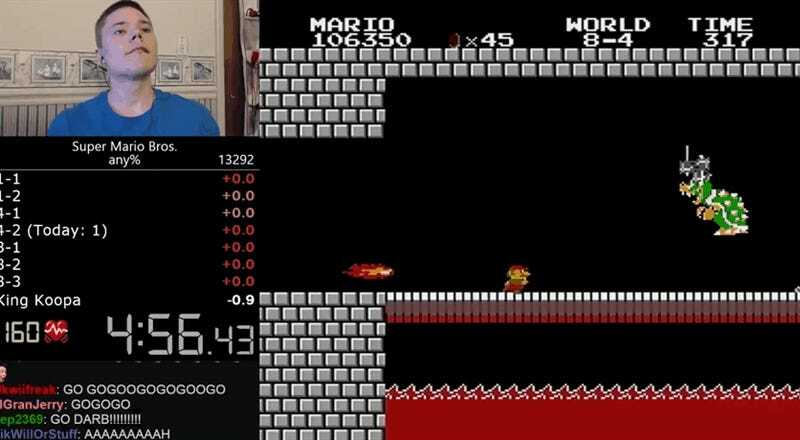 Earlier this month we actually profiled Darbian and his quest to get a “perfect” run of Super Mario Bros. As you might recall, speedrunners for this game have optimized their routes so well that getting faster times for Super Mario Bros. was a difficult prospect. It took years to shave off half a second from the world record. For months, the thought was that it might take a while for anybody to get a better time. But last night, Darbian managed to whittle off some more milliseconds from the record time anyway. Watch as he destroys Super Mario Bros. in 4:57.260 below. The record was achieved on an actual console, which was rigged to a stream that displays Darbian’s heart rate as he plays. As you might expect, Darbian’s heart starts racing as it becomes clear that he’s on a record pace. At the end of the run, Darbian’s heart rate reaches a high of 172 beats per minute. The run is in the “any percentage” category, which allows him to complete the run without having to go through every single portion of the game. The speedrun also makes use of a variety of different strategies, such as the bullet bill glitch, which allows Darbian to skip the castle walk at the end of the level. We go into more detail about other common Super Mario Bros. strategies here.